St. John’s House of God has graced Church Hill for over 180 years. It was constructed in 1830 under the pastorate of Rev. Abraham Reck. Before the stone walls could be raised, the country folk needed to raise a lot of cash money, when the going wage was barely 35 cents a day. The actual cost of construction of St. John’s Church is unknown. An estimate has been placed at $1,800 to $2,000. About half that amount was collected by public solicitation. Work began in the Spring of 1830. The foundation was dug with pick and shovel. Chestnut, oak and poplar logs were hauled to the Shady Grove sawmill, operated at that time by “The Walking Preacher”, Jacob Leatherman. Tons of rocks, gathered from fields and stone fences, were dragged to the building site on horse-drawn sleds. Clean sand was scooped from creek beds. Bricks were baked for the chimney. Frederick Lowe and Lewis Jones are thought to have been the stone masons. Local carpenters made the benches. The interior was just one large room, with wrap around galleries on three sides. In keeping with German tradition, the sanctuary was designed with two front doors, one for gentlemen and one for ladies. In the beginning, the church had no bell tower. Then in 1895, carpenters constructed a belfry. A 700-pound church bell was cast in Cincinnati at a cost of over $200.00. Money was raised by donations from church members and public solicitation. Its melodious strains would call neighbors to worship each Sunday. It would also ring to alarm for fires and other emergencies. At the time of a death in the community, the tolling mechanism would count out the age of the deceased. 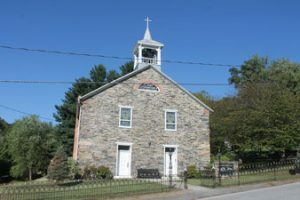 Today, St. John’s Evangelical Lutheran Church at Church Hill continues to serve its faithful congregation as well as the local community.